Next time you can't decide on that perfect cabinetry for your kitchen remodel, why not bag the idea all together and just display the dishes instead? It's an 'I don't take myself too seriously' look I find hard to resist! 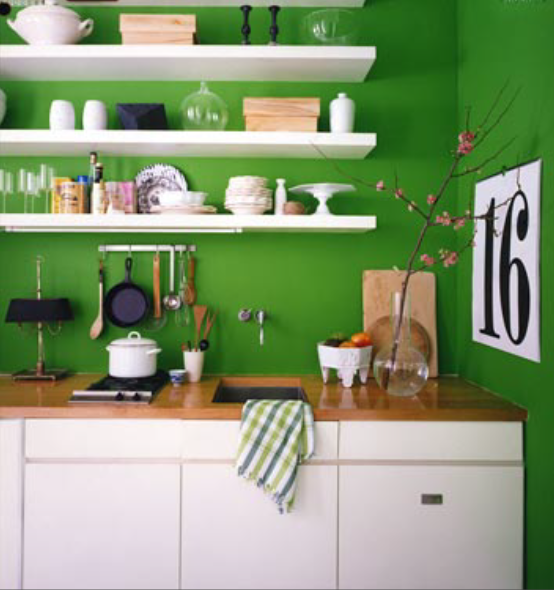 Add a little whimsy to the casual look with a splash of something bright, like apple green! Then pair it with ceramic whites for instant pop! 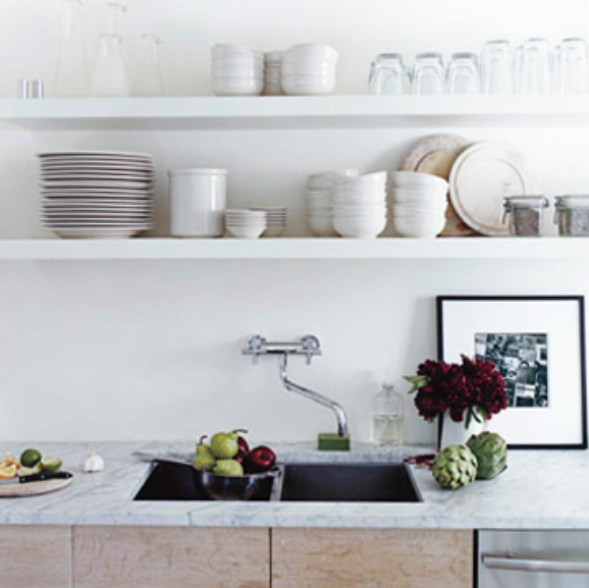 Dishes of varying shapes and sizes create loads of dimension and interest to any kitchen. The key is keeping it visually clean through a simple color palette, like soothing taupes and creams. Of course, some dishes are just too pretty to keep hidden behind closed door. So bring them out, showcase them like art, and create your own little display. How delightful! I adore this look! the third photo is gorgeous!! That's exactly what I do, because I'm too lazy to open cupboards. And it's a good incentive to be neat and not accumulate back of the cupboard type junk. I love this look and I think it would force me to make my shelves look nice all of the time. But I shudder at the thought of constantly having to dust and clean the dishes on the top shelf that don't get used often! My favorite is the top image! 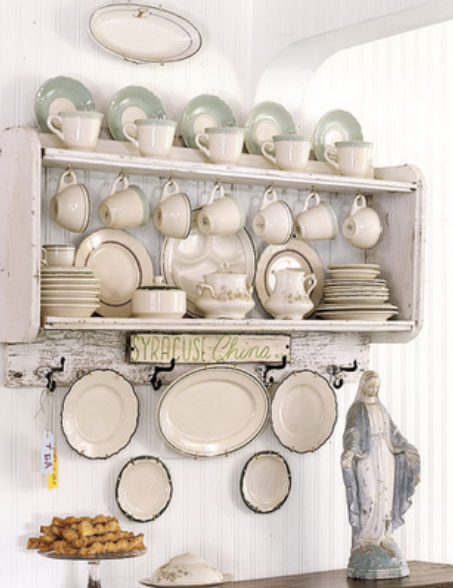 I absolutely love the open shelve look; it is also a great cost saving measure and provides greater opportunity to change up the look (with new dishes) or with the simple addition of new glass ware, etc. i LOVE open shelving, i'd have it no other way. these are all great examples. This is EXACTLY what I keep trying to tell hubby! I love the look AND I love the new banner on your site (for some reason I just noticed that.... it's awesome!). I love open shelving especially in galley kitchens, so the shelves run the whole length, and can be a place for tabelware and dishes and the odd black and white photo. Oh, have fun tonight! That will be so much fun. I love darryl carter's work! And these stunning shelf displays are just pure eye candy.